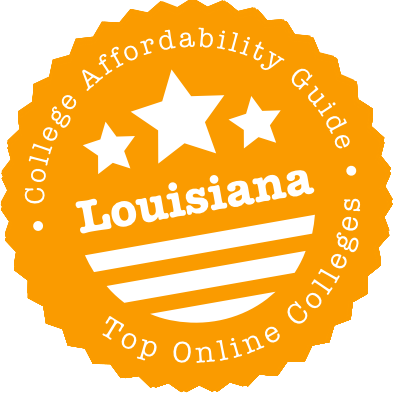 Scroll down to see the top not-for-profit colleges and universities in Louisiana offering online degree programs. At Northwestern State University of Louisiana, online students can complete everything from an associate degree to a doctorate degree. At the bachelor's level, offerings include public safety administration, addiction studies, and business. At the master's level, 16 education degrees are offered, and several of the programs have multiple concentrations available. Nursing, radiologic science, and homeland security master's degrees are also available. Teachers can also earn educational specialist degrees or complete add-on certifications for their licenses in a dozen areas. The 2018 U.S. News rankings place Northwestern State at No. 68 for Online Graduate Nursing Programs and No. 155 for Online Graduate Education Programs. Louisiana Tech University offers several online non-credit courses and certificate programs. Instructor-led courses are offered in accounting and finance, business, college readiness, computer applications, design and composition, health care, language and arts, law, personal development, teaching and education, technology, and writing and publishing. Many online professional certificate programs are also offered in an open enrollment, self-directed format, including 26 certificate programs in health and fitness, 89 programs in business and professional topics, 57 programs in IT and software development, 48 programs in management and corporate topics, 11 programs in media and design, 19 programs in the hospitality and service industry, 19 programs in skilled trade and industrial topics, 11 programs in sustainable energy and 8 career-focused high school diploma programs. eULM runs more than 35 degrees from the associate to the doctoral level. Apart from a pair of undergraduate General Studies programs, degrees can be divided into five groups. The largest is health sciences, which is bigger than just a nursing program. It facilitates baccalaureates and advanced degrees in specialized occupations such as radiology and dental hygiene. Education is another popular area online, with four MATs, three MEds and a doctorate. The other three groups are behavioral sciences, which covers criminal justice and psychology; humanities, with language and history credentials; and business, which includes a top-60 MBA as ranked by U.S. News and World Report in 2017. McNeese State University offers online bachelor's programs in criminal justice, family and child studies, management, nursing, psychology, sociology and a post baccalaureate certificate in school librarianship. Additionally, online graduate programs are available in family nurse practitioner studies, health and human performance, nurse educator studies, nurse executive studies and psychiatric mental health nurse practitioner studies. The school also offers online graduate certificates in fields like educational diagnostician studies, family nurse practitioner studies, psychiatric mental health nurse practitioner studies and reading specialist studies. McNeese State uses the Moodle learning management system for the delivery of online courses. Nicholls State University offers eight undergraduate degrees online, including an Associate of Science in Safety Technology, a Bachelor of Arts in History, a Bachelor of Arts in English, a Bachelor of Arts in Sociology, a Bachelor of Interdisciplinary Studies, a Bachelor of Science in General Family and Consumer Sciences, a BSN in Nursing and a Bachelor of Science in Business Administration. A post-baccalaureate certificate in applied business administration is also available online, as are several online master's degrees in subjects like education leadership, community/technical college mathematics and nursing. Nicholls State uses the Moodle learning management system for the delivery of online courses. Nurses seeking an advanced degree can earn a master's or doctoral degree online from Loyola University New Orleans. The Doctor of Nursing Practice offers two tracks for nurses who already have a master's in nursing: nurse practitioner or executive leader. Applicants who have a bachelor's degree in nursing can enter a track leading to certification as a Family Nurse Practitioner. The online Master of Science in Nursing program allows students to specialize in family nurse practice, nurse education, or health care systems management. Working registered nurses who have a bachelor's degree in a subject other than nursing can enter the program after passing a two-course online bridge program that Loyola calls the Bridge to Leadership Education for Nurses at a Distance, or BLEND. Applicants to the MSN programs must have an unencumbered nursing license and a bachelor's degree with a minimum GPA of 3.0. Working nurses with a diploma or associate degree can earn their Bachelor of Science in Nursing online through Loyola, which allows substantial course substitution for transfer credits and does not require any onsite clinicals. LSU has two bachelor's degrees that can be pursued completely online, namely a Bachelor of Arts in Organizational Leadership and a Bachelor of Science in Nursing. The university also offers two other bachelor's degrees as hybrid programs, the Bachelor of General Studies and the Bachelor of Science in Family and Consumer Sciences. In addition, there are two master's degrees that are offered as hybrid programs, the Master of Arts in Special Education - Early Intervention Birth - 5 and the Master of Science in Nursing. SLU has one online doctoral program (Doctor of Nursing Practice) and two online graduate certificate programs (Family Nurse Practitioner and Psychiatric Mental Health Nurse Practitioner). The university uses Blackboard as its online learning management system. Louisiana State University offers several certificate programs through its Continuing Education department that can be completed off-site through a combination of online, web-enabled and print-based courses. These certificates are offered in the academic disciplines of accounting, liberal studies, business communication and human services. Additionally, the school offers more than 40 individual online courses in subjects like economics, English, German, entomology, history, kinesiology, marketing music, psychology, sociology, Spanish and dance. Online courses at LSU are conducted using the Moodle course management platform. The Center for Applied Environmental Public Health (CAEPH) at Tulane University offers the following Master of Public Health (MPH) programs online: MPH in Occupational Health and Safety Management, MPH in Occupational and Environmental Health, and MPH in Disaster Management. Each program requires the completion of at least 42 hours of academic credit, 18 of which must be made up of core coursework from the School of Public Health and Tropical Medicine. CAEPH also offers a Master of Science in Public Health in Industrial Hygiene (MSPH-IH) degree that can be pursued online. The program consists of 45 hours of academic credit. Although this is an online program, students must attend a one-week, on-campus session to perform the laboratory requirements for the Air Sampling & Analysis course. The program's practicum and culminating experience can be completed in the student's home community. The MSPH-IH degree is accredited by the Applied Science Accreditation Commission of ABET (Accreditation Board of Engineering and Technology). Students who graduate from the program fulfill the educational requirements for the CIH certification exam administered by the American Board of Industrial Hygiene. At the current time, Tulane University offers two online certificate programs in the fields of disaster management and in industrial hygiene. Louisiana is making college cheaper for online students! Websites like Louisiana Online and the SREB E-Campus are speeding up the search process. Programs like the Transfer Degree Guarantee (TDG) and UL’s Bachelor of Arts in Organizational Leadership are helping to slash costs. Discounts are available for out-of-state online programs. And a number of schools are now offering accelerated degrees. Learn more about all these developments in our short guide to choosing an online program in Louisiana. Sponsored by the Louisiana Board of Regents, Louisiana Online is a database of online & hybrid programs offered by the Louisiana Community and Technical College System, the Louisiana State University System, the University of Louisiana System, and the Southern University System. (Check out the full list of schools.) You can use the Program Search to search by degree level, type, topic, or category. The website also has advice on Prior Learning Assessment (PLA) options, paying for college, and assessing your distance learning readiness. Financial aid is available for these degrees. The Transfer Degree Guarantee (TDG) makes it easy for students from a two-year community college to transfer to a Louisiana four-year public university. This can save students a considerable amount of money in the first two years of college. A large number of Louisiana schools participate in the program. To be eligible for the guarantee, students must earn an Associate of Arts/Louisiana Transfer degree (AALT) or an Associate of Science/Louisiana Transfer degree (ASLT) with a minimum grade of “C” in each course and meet the admission standards for the four-year university. If they do so, all 60 hours of their course work will transfer. Online AALT and ASLT programs are available from certain community colleges and online bachelor’s programs (i.e. degree completion programs) are available at four-year universities. Use the Program Search on Louisiana Online to find them. The University of Louisiana (UL) System has developed a great online degree completion program for adults called the Bachelor of Arts in Organizational Leadership. Prospective students need to have at least 60 hours of college credit and must be 25 years old or older. However, students with less than 60 hours will have opportunities to earn credit online. In this interdisciplinary degree, students complete 30 hours of online core courses (offered jointly by faculty at UL’s nine universities) and 30 hours of online concentration and elective courses (offered by the “home” institution). Nine different degree concentrations (e.g. foodservice strategies and operations) are available. The core curriculum tends to focus on business-related areas such as organizational behavior, management, ethics, interpersonal skills, communication, and finance. Classes are offered five times throughout the year in accelerated eight-week terms. There are no program fees and students are charged a flat per credit hour rate. Each UL university has financial aid opportunities for non-traditional students. Debating between Louisiana schools and out-of-state options? Have a look at the Southern Regional Education Board (SREB) Electronic Campus. SREB has partnered with a number of schools all over the south to create an online program & course catalog. You can search for any degree program or a specific course. Programs that are marked “E” are offered at the Electronic Rate, which means the in-state and out-of-state tuition rates are the same. Almost all of the Louisiana schools with programs listed in the SREB catalog are public universities. These schools include Bossier Parish Community College, Louisiana State University and A&M College, Louisiana State University (Alexandria), Louisiana State University (Shreveport), Nicholls State University, Northwestern State University of Louisiana, Nunez Community College, University of Louisiana at Lafayette, and the University of Louisiana at Mon. However, the private and regionally accredited Our Lady of the Lake College also participates in the catalog. The SREB also runs the Academic Common Market-Electronic Campus (ACM-EC), a program that allows students to pay in-state tuition rates for certain out-of-state online degrees. There are some restrictions, however. Approved ACM-EC programs have to be offered in one of the 15 participating SREB states. Also, you won’t be eligible for discount tuition rates if a public college or university in Louisiana already has a degree program in your chosen field of study. To apply, you will need to meet the admissions requirements of the college or university that offers the program and be certified as a resident of Louisiana by an ACM coordinator. Visit the ACM-EC website for instructions. These Louisiana schools appear on both our “Top Online” and “Most Affordable” lists. That means they were able to meet our rigorous criteria for quality, flexibility, price, and use of financial aid money. (You’ll see a CAG Score next to their profiles in our ranking.) We also recommend a quick look at the financial and student statistics (e.g. average debt load) on College Scorecard. Louisiana Tech’s Global Campus dubs itself the gateway portal to LTU’s online degrees & courses. However, it’s the Division of Finance and Comptroller that has up-to-date info on tuition & fees, and the Office of Financial Aid that has details on grants & scholarships. Tuition rates are the same for online and on-campus credit hours. Out-of-state students may qualify for the Bulldog Out-of-State Fee Waiver. SELU’s Distance Education section has a full list of its hybrid & 100% online degree programs and courses. Details about each program can be found on the degree’s webpage. Tuition & fee information is available through the Controller’s Office. The Office of Financial Aid is the first stop for grants & scholarships. Military and veteran students are eligible for VA education benefits. Need job skills? SELU has partnered with ed2go to offer online career training programs that focus on in-demand occupations (e.g. hospitality, construction, IT, etc.). These open enrollment programs are composed of non-credit, skills-based courses. Since the courses are non-credit, they do not quality for financial aid. However, other forms of financial assistance are available. Whether you’re looking at schools in Louisiana, California, or the great state of Maine, be sure your college or university is fully accredited by an organization recognized by the U.S. Department of Education. Although national accreditation applies to distance learning institutions, regional accreditation is the gold standard, especially if you’re thinking of transferring credits. The Southern Association of Colleges and Schools Commission on Colleges (SACSCOC) is in charge of regional accreditation for degree-granting higher education institutions in Louisiana. The homepage allows you to search for accredited institutions by state. The page on Accreditation Actions will also list if a Louisiana school has recently received a Warning or Probation because of quality concerns. The Council for Higher Education Accreditation (CHEA) Database provides a full list of regional & national accreditations for every university in the country. A number of religious schools in Louisiana (e.g. Cranmer Theological House, Evangel Christian University of America, Louisiana Baptist University, etc.) hold no regional or national accreditations of any kind, so check those accreditation databases before you commit. In addition, here are a few institutions that have experienced quality issues in recent years. American Coastline University is an unaccredited school that used to operate in Louisiana. It holds no recognized national or regional accreditations and does not appear in the CHEA Database or College Scorecard. Ashington University is an unaccredited school that holds no recognized national or regional accreditations. It does not appear in the CHEA Database or College Scorecard. Centenary College is regionally accredited. However, SACSCOC placed the school on Probation in June 2016 for one year due to concerns with financial stability and short-term finances. On other hand, a 2016 KSLA News article noted that the school had been awarded the only “A” grade in the state of Louisiana for college and university financial health by Forbes Magazine. It also has “one of the largest endowments per student in the country with an investment portfolio of just over $130 million.” What’s more, College Scorecard reports strong student statistics. On June 15, 2017, Centenary College of Louisiana’s Disclosure Statement was deleted from the SACSCOC website. Glenford University is an unaccredited school that holds no recognized national or regional accreditations. It does not appear in the CHEA Database or College Scorecard. Kingdom College of Natural Health holds no national or regional accreditations recognized by the U.S. Department of Education. It does not appear in the CHEA Database or College Scorecard. University of Phoenix is a for-profit institution headquartered in Arizona. The CHEA Database notes that it is regionally accredited by the Higher Learning Commission (HLC), but it has been subject to a number of lawsuits over the years. College Scorecard reports that the Baton Rouge campus has a low graduation rate and a lower than average number of students paying down their debt within the first three years of leaving college. Southern Association of Colleges and Schools Commission on Colleges (SACSCOC): Sometimes referred to as SACS, this is the regional accrediting body for degree-granting higher education institutions in Louisiana. Use the homepage to search for accredited institutions by state. Louisiana Connections Academy (LACA): LACA is a tuition-free, online K-12 public school run by Connections Education LLC. It is accredited by the Southern Association of Colleges & Schools Council on Accreditation and School Improvement (SACS CASI) and authorized by the Louisiana State Board of Elementary and Secondary Education. Louisiana Distance Learning Association (LaDLA): LaDLA is a non-profit association dedicated to helping educators in the field of distance learning. It organizes conferences and professional development opportunities. Transfer Degree Guarantee (TDG): TDG is a program that makes it easy for students from a two-year community college to transfer a Louisiana four-year public university. Online TDG degrees are available. Louisiana Online: Use the Program Search to find online or hybrid programs in the Louisiana Community and Technical College System, the Louisiana State University System, the University of Louisiana System, or the Southern University System. Southern Regional Education Board (SREB) Electronic Campus: Search for online degree programs or courses being offered by participating Louisiana institutions in the SREB campus.